I’ve been thinking lately that I might need some Hawthorn in my life. You’ve probably seen Hawthorn trees, they’re planted in most of the parks in New York City. They tend to be short and wide with winding branches; perfect climbing trees if it wasn’t for the thorns on the trunk and branches. (Haw is another name for berry and then there’s the thorns.) On some species they look really lethal. In fact, hawthorn is quite gentle. The berries and flowers are cardiac tonics, strengthening the heart and evening its beat. Whether you need to be stimulated or relaxed hawthorn is on the job. It dilates arteries and veins releasing constrictions and blockages. It lowers blood pressure and aids in maintaing healthy cholesterol levels. Hawthorn can be used both as a preventative tonic to keep the heart in good health and as a treatment for heart problems including angina, coronary artery disease, and loss of function due to old age. I believe hawthorn is also a remedy for the more intangible ills of the heart, for those times when we feel “heart sick”, “heart broken”, or just a bit melancholy. If we are having trouble expressing our emotions hawthorn can help us to open our hearts and be healed. 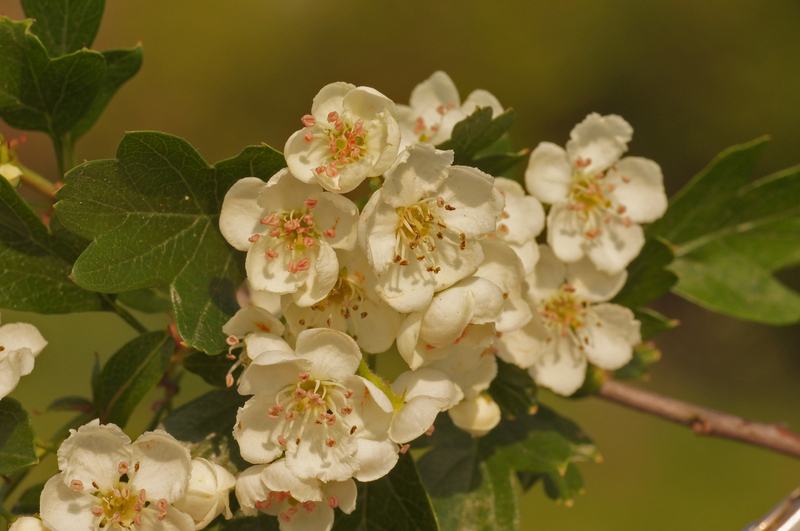 Hawthorns bloom in May with white, pink, or red flowers. The tree was called the Queen of May, the May Tree, or the Faerie Tree and the blossoms were used in Beltane and May Day celebrations. Hawthorn was treated with respect as it was a faerie tree and stood on the threshold of the Otherworld. I heartily recommend going and sitting with a hawthorn tree. There’s a great guide to trees in NYC put out by the City of New York Parks and Recreation department. It’s called “New York City Trees: A Field Guide for the Metropolitan Area”. It has information on identifying trees as well as a guide to the best place to see each tree. Or you can look it up on the internet and get a sense of what you are looking for. Don’t worry about identifying the individual species, it’s pretty difficult even for professional botanists. The hawthorn trees have apparently cross pollinated with abandon and a complete disregard for the botanical classification system. (Another reason to like them). You can look for the thorns and the blossoms (they’re still in bud this week but will bloom soon). When you find one, take a good look at it, really see it. Touch the bark and smell the blooms – they have a musky scent, not what you’d expect from a flower. Then have a seat and lean back against the trunk of the tree, feel it against your back, and just sit for a while. It is in silence and communion that we can get to know the plants and trees that share our world, that make our lives possible.